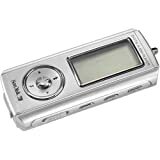 SanDisk 1 GB MP3 Player: This is the year of the $99 1-Gigabyte MP3 players. The SanDisk model pictured here is currently going for $94 and supports WMA files with Windows Media DRM as well as good old-fashioned MP3s. There’s also the Creative MuVo Micro N200, also going for about $100. Don’t forget the Radio Shack model we reviewed earlier, and the Walmart model mentioned here. For those who value style, you can get an Apple iPod Shuffle for under $100, but you’ll have to settle for 512MB. The Shuffle also has no display, but Apple tells me that’s a good thing. Sony Pro MDR-7506 Headphones: Need a gift for someone who already has a favorite MP3 player? How about a nice pair of headphones. The Sony MDR-7506 is a mainstay of musicians and DJs, and is an affordable $99. They’re big and clunky, though. If you need a gift for a more fashion-conscious iPod user, these Etymotic ER6iC Isolator Earphones seem to be recommended by just about everyone, and they come in iPod white. Personally, I find phones that stick inside my ear uncomfortable, but then again, my 7506’s aren’t exactly pocketable. Epson Stylus R200 Photo Printer: Inkjet printer prices have dropped dramatically this year. 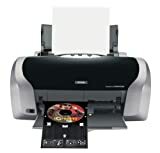 We bought this Epson for $89 earlier this year and have been very impressed. It’s the most reliable inkjet I’ve seen, producing perfect full-color pages even when it has been sitting unused for a week or two. Bonus: it also prints directly on CDs or DVDs. The bad news is that inkjet refill prices have not dropped, and with six separate ink cartridges at $15 each, it might be cheaper to buy a new printer (which includes all six) than to refill this one. The ink lasts longer than our last inkjet, though, so this hasn’t become an issue yet. Our review of this printer is coming soon. Logitech Cordless Desktop MX 3000 Laser: A cordless mouse is surprisingly useful. The cord doesn’t get in your way, and you can switch from right-handed to left-handed use whenever you wish. Today’s cordless mice have much better battery life than their ancestors, and prices are lower than ever. This set includes Logitech’s redesigned laser mouse and a cordless keyboard for $65. 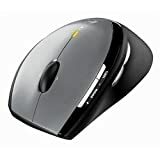 You can also get my mouse of choice, the Logitech MX1000, for about $50. Western Digital 80 GB External USB 2.0 Hard Drive with Dual Option Backup: External hard disks used to cost quite a bit more than internal ones, but they’ve recently become competitive, and you can now get an external disk for under $100. We’ve linked to an 80 GB model to stay under the $100 limit, but if you shop around, you should be able to find 100 GB or 200 GB for a bit more. Since just about everyone needs more disk space, and a USB disk can be plugged in without any tools, they might be a good choice for any computer owner on your list. 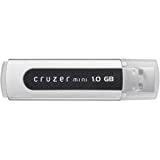 SanDisk SDCZ2-1024-A10 1 GB Cruzer Mini USB 2.0 Flash Drive: USB drives are another thing that seems to get cheaper every day, and 1 GB models have just passed the $100 barrier, which is simply amazing to those of us who spent hundreds for hard disks back when they were measured in Megabytes. These are handy for backing up files or shuttling data from computer to computer. The smaller ones make good lower-budget gifts: for example, 256 MB for $25. Shop around and you’ll find them even cheaper. 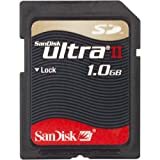 SanDisk SDSDH-1024-901 1 GB Ultra II Secure Digital Memory Card: Anyone with a digital camera (or maybe a card-based MP3 player) can use more memory, and you should easily be able to find a 1GB card for under $100. Sandisk Ultra is a great choice, and if you don’t need the speed, the regular Sandisk 1 GB Card is only $69: or $99 including an MP3 player at Radio Shack. Don’t forget that there are many standards for memory cards (CompactFlash, SD, Memory Stick, etc.) so get the right one for their camera. Sandisk ImageMate 12-in-1 USB 2.0 Hi-speed Reader ( SDDR-89-A15 ): Most digital cameras can’t tell the difference between a cheap SD card and one of the high-speed ones (see our article) but there’s one place you can tell the difference. A good high-speed card reader will whip through downloads much faster than an older reader, such as the one that might be built into your computer. It’s likely much faster than a USB connection directly to your camera, too. For $30 or so, you can get a reader that supports all of the memory formats at high speed: a perfect gift for the digital camera buff who has everything. Sanyo ECJ-E35S 3.5 Cups Micro-Computerized Rice Cooker / Steamer: Let’s not forget kitchen gadgets. While $99 sounds expensive for a rice cooker, you haven’t cooked rice until you’ve tried one of the computerized ones. In fact, until I purchased this Sanyo model, I was only able to create a glue-like substance from rice. With a computerized cooker you add the rice, add the water, and press a button. It seems to work even if you get the amount of water wrong. Zojirushi is the Japanese favorite for computerized rice cookers, but I’ve been very happy with this one, which can cook about 8 2-oz servings of rice at a time. Our review of this rice cooker is coming soon. If you know anyone who enjoys rice, they may not know this exists, but they’ll love it. Leatherman 830040 New Wave Multi-Tool with Nylon Sheath: Shopping for the sort of geek who already has one of each of the above? When all else fails, get them a Leatherman tool. The one at left is a bit pricy at $69, but it has an amazing assortment of tools. Cheaper ones start at $20, and they’re all nice, high-quality tools. Any gadget geek or do-it-yourselfer would love one of these, and ordinary folks might find one handy to keep in the glove box. Got any better ideas? Disagree with any of the above? Let us know.